Eating more plants and fewer animal products is the best thing one can do for the planet– that is according to one of the largest and most comprehensive analyses conducted to date. reduce agricultural land use by as much as 76%, or 3.1 billion hectares– an area of land four times the size of Australia. Arable land use (i.e. that which is useful for growing crops) could also be reduced by approximately one-fifth. reduce the climate impact of the food system by nearly half (49%)– conferring annual greenhouse gas emissions savings of 6.6 billion tonnes of carbon dioxide equivalents. This is roughly equivalent to a 14% reduction in global annual greenhouse gas emissions. reduce global acidification and eutrophication by half (50% and 49%, respectively), which, together, contribute to ecosystem degradation and biodiversity loss. reduce scarcity-weighted freshwater withdrawals by 19%. Big project | 38,700 farms; 1,600 processors, packaging types, and retailers; 119 countries; 40 food items; 5 indicators of planetary health. 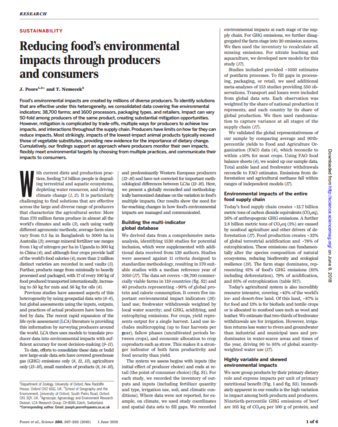 The project's researchers, Poore and Nemecek, conducted a large meta-analysis of studies investigating the impact of food on the environment. Their 'methodologically-harmonised' database, which includes 570 individual studies, covers 40 food items (representing 90% of global energy intake) and spans 119 countries, 38,700 farms, and 1,600 processors, packaging types, and retailers. One of the study's most significant findings relates to the marked discrepancy between environmental impacts of plant- and animal-based food items: even the most sustainably produced animal products tend to carry a significantly greater environmental burden as compared to plant-based alternatives. The discrepancy is such that production of meat, fish, eggs and dairy currently occupies 83% of the world's agricultural land and releases 58% of food-related emissions, while only providing 18% of the global population's calories. Producers have limits on how far they can reduce impacts. Most strikingly, impacts of the lowest-impact animal products typically exceed those of vegetable substitutes, providing new evidence for the importance of dietary change. Producers monitor their impacts using digital tools with data being independently certified. Evidence-based assessment tools are developed by researchers through the consolidation of the existing literature. Researchers provide produces with numerous pathways to reduce their environmental impacts, while producer-led innovation and practice sharing is encouraged and supported. Environmental targets are set by policy-makers and producers are incentivised to meet targets through ‍tax breaks or reallocation of the five hundred billion dollars currently spent on agricultural subsidies globally every year. Consumers are informed about the 'true cost' of food and sustainable consumption is incentivised through a combination of environmental labelling, taxation, and subsidy.